Take a step back to see how and what was expected as far a social behavior of our parents or grandparents — you might be quite amazed and amused. 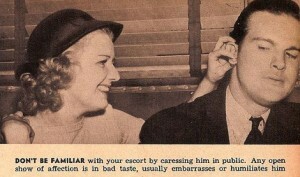 On the ‘Mashable‘ site are scanned pages from a ‘guide’ to the proper behavior of young ladies in 1938. It was done in photos (acted out scenes) and what a proper young lady should and should not behave like in public and especially with a husband or boyfriend. The caption below each photo explains what behavior is inappropriate. For example, don’t wear in public wrinkled leg stockings. When dancing with your partner, don’t talk too much, the gentleman wants to dance. Never be openly affectionate out in public, it might embarrass him. Your date or husband wants you to talk about him, re-frame from talking about yourself. When your date arrives, don’t keep him waiting – greet him with a smile. Those are just some of the dos and don’ts in this pamphlet. 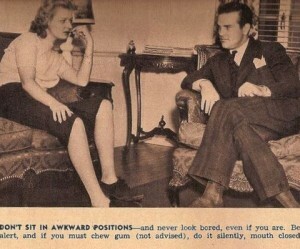 Again with the photos and captions it is quite interesting, seeing what social life for women was over 75 years ago. Pick a couple such expected behaviors and discuss them with any female relatives, even those who were young ladies in the 1940s and 1950s – many such behaviors still practiced then, not just in the 1930s. There could be some very interesting, eye-opening discussions held. One similar discussion I had with my mother-in-law revealed, it was a practice of any during the early 1940s-the war years-you didn’t have to let a fellow know you were married, it was OK to let him assume you were single. Photos: Samples of the 1938 proper behavior pamphlet pages.